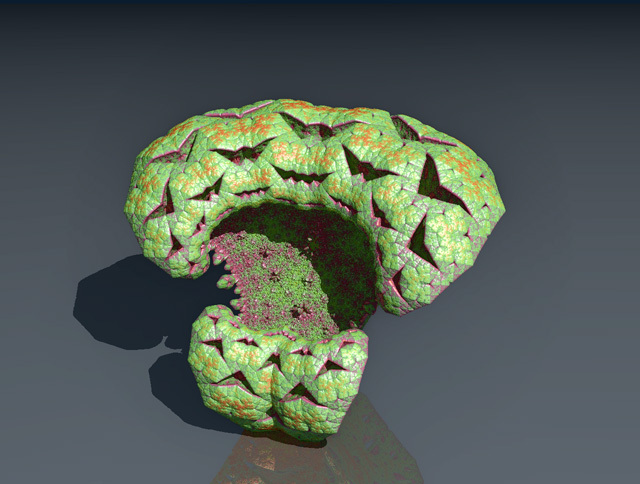 Here are some renderings of a class of fractals which I call "Kaleidoscopic IFS". There is a big variations of shapes one can get with this method. Then I added a rotation before the fold or before the stretch or both. Then I allowed the center of stretching to be modified. This gives 1+3+3+2=9 parameters in total (scale->1,rotation1->3,rotation2->3,center of stretch->2). - half tetrahedral symmetry planes: the same than above. 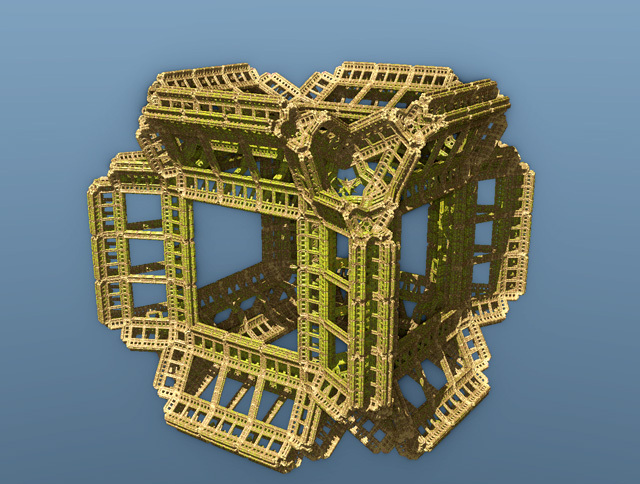 Which gives the menger sponge when used with CX=CY=CZ=1, scale=3 and no rotation. Here are some renderings of a class of fractals which I call "Kaleidoscopic IFS". This last image is very intriguing!!! A lot of possibilities!!! The second and fourth in the first post are especially interesting. Can you try varying one of the values with one of the axis? Amazing one subblue! At some point, it looks like savannah. You are using the GPU I gess. Is it realtime? There are many other known fractals that may appear from nowhere. I've already met the Koch curve, cantor dust and others I don't know the name. The variation of possible shapes, from geometric figures to organic forms, still amazes me. The possibilities are infinite , not only by changing the parameters but also by changing the algorithm. What I've described in the O.P. is actually what I've explored so far. The main ingredients are the folding and the stretching, that is, kneading the space . Then add some salt and spice. Seriously! In the case of this class of fractals, folding are done about planes and stretching is an homothety. The rotations may be the salt and spice. I realize now that one can insert as many rotations between the foldings. In principle other transformations than a rotation can be used (but I may be wrong). The nice thing with rotation (and other orthonormal transformations) is that the distance estimation remains very simple and the generated distance field is continuous. I guess because they don't add stretching. I think the kneading process is what is done to generate escape time fractals in general... but this is a little bit off topic. I'll start another thread. PS: Most ideas behind these fractals were found in this forum. 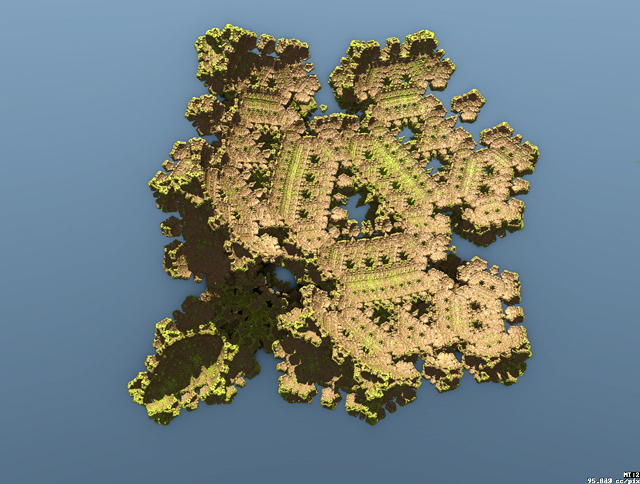 PS2: BTW, I think these fractals may be rendered as attractor set just like classical IFS or julia sets. Unfortunatly, I have forgotten the parameters used for these pictures. Currently, in my program (actually an evaldraw script), it's impossible to save the parameters. I'll try to find them and do some little image sequences. I think the "-2" is not needed as R will be greater than the bailout, so substracting 2 does not make a big difference. For the rest the DE is the same as the one for the Mandelbox.. The -2 is in reality the radius of a bounding sphere of the fractal (this is not the smallest one. In my case it's 1 for the octo-sierpinski and sqrt(3) for the tetra-sierpinski and the octahedron). If you use say max_iterations=10, when zooming you obtain at some point only dust and the rendering becomes much slower. It is not necessary when using a big max_iterations, the dust is hidden by the solid threshold. I do the same thing for Tglad's amazing box for the same reason. 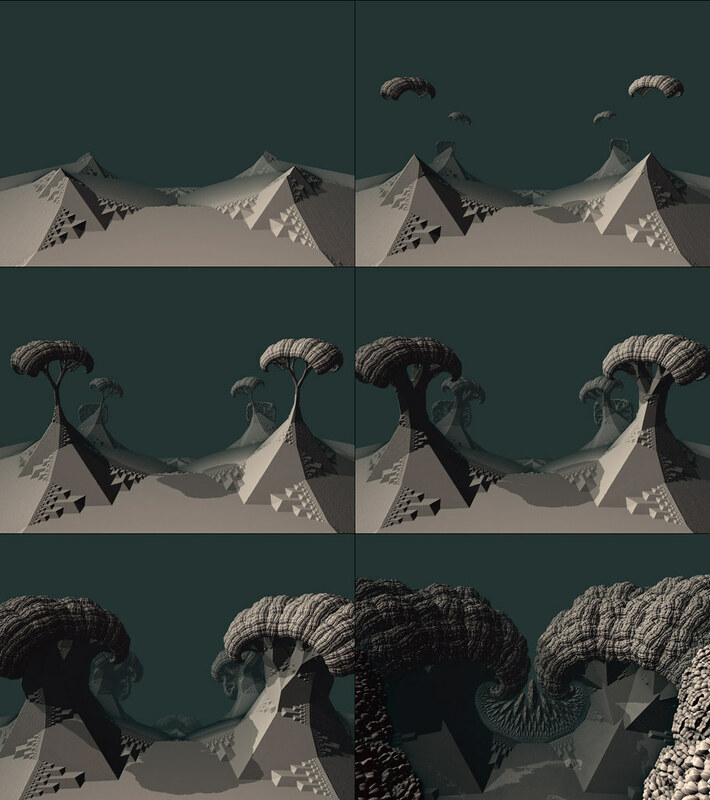 For the mandelbulb I use sometime a similar technique. Instead of DE=0.5*r*log(r)/dr, I use DE=0.5*r*log(sqrt(r^2+1.5^2)-1.5). All this is in order to get a DE based solid threshold consistant with max iterations solid threshold. Also, on can use the distance to the bounding volume of the fractal instead of the bounding sphere. 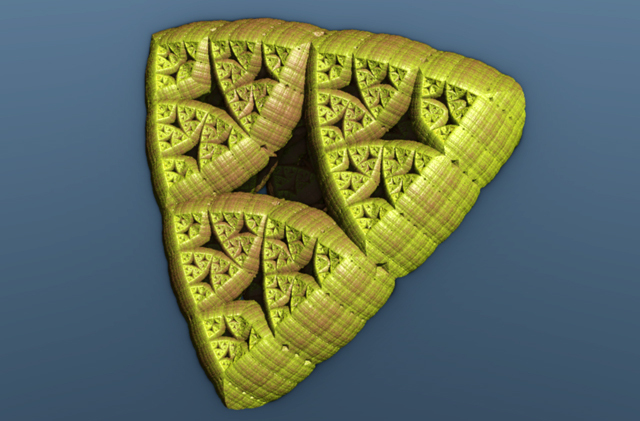 in the case of the tetra sierpinski it's simply (and obviousely) a tetrahedron... etc. In general it isn't worth the pain. I'll post the full algorithms later. At the angle there is a Koch triangle!